Dr. David Wong is a published Author appearing on Fox News and in the Wall Street Journal. His expertise is periodontal plastic surgery. Guest Speakers3. Dr. David Wong is a published Author and has appeared on both Fox News and in the Wall Street Journal. His specialist area of expertise resides in periodontal plastic surgery; he teaches other dental professionals and lectures both nationally and internationally on the latest in surgical innovations and techniques. 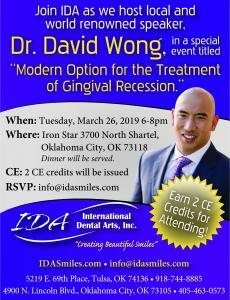 On Tuesday, March 26th, at the Iron Star in Oklahoma City, IDA is hosting Dr. Wong for a specialist seminar that will address the topic of the latest innovations and treatment options available for the treatment of Gingival Recession; a condition that is estimated to affect at least 20 million people over the age of 29 in the U.S alone. The number of people who experience problems with receding gums is increasing exponentially, and this is one of the core reasons that IDA has taken steps to invite an internationally renowned lecturer to run this session. Dental professionals in attendance will be treated to an exciting seminar that covers a very pertinent subject along with information about the latest innovations in this particular area of dentistry. Dinner and CE Credits are also provided to guests. Two industry-experts with a combined experience of more than 60 years’ in the dental sector have been invited to speak at a specialist seminar that is being held inside the Devon Energy Center in Oklahoma City. In the dental world, getting these two experts together to talk about the practical techniques and technologies that enable lab technicians to provide the most predictable results is a major talking point. Dr. James C. Kessler and Mike Archibald of both highly-regarded as leaders in their respective fields. Both of these respected professionals have lectured internationally. At this unique seminar, both of these guests will spend an entire day discussing preparing records for laboratory cases. Dental professionals in attendance will be treated to a comprehensive seminar that covers a huge range of situations that any lab technician might find themselves having to deal with. Breakfast and Lunch are available on the day, and CE 8 Credits are also on offer for attendees. 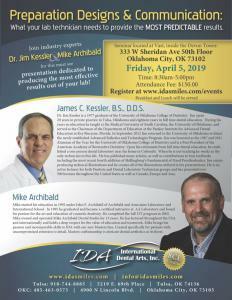 The session is expected to be one of the most popular ever held by IDA and the special guests to both of these events have been hand-picked to ensure their credibility, suitability, and relevance to the Tulsa and Oklahoma dental market. 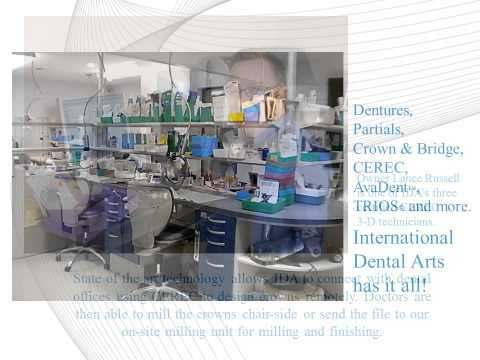 International Dental Arts1 Inc. has offices in Tulsa and Oklahoma City. They are a family owned and operated business since 1984. After more than 30 years in the industry, they have earned the acclaimed status of an industry-leading organization in their respective field. They have one of the largest dental laboratories in the U.S and provide a range of dental products that are created onsite. They provide dental laboratory services to clients nationwide. Looking for an SEO/PR Company2?